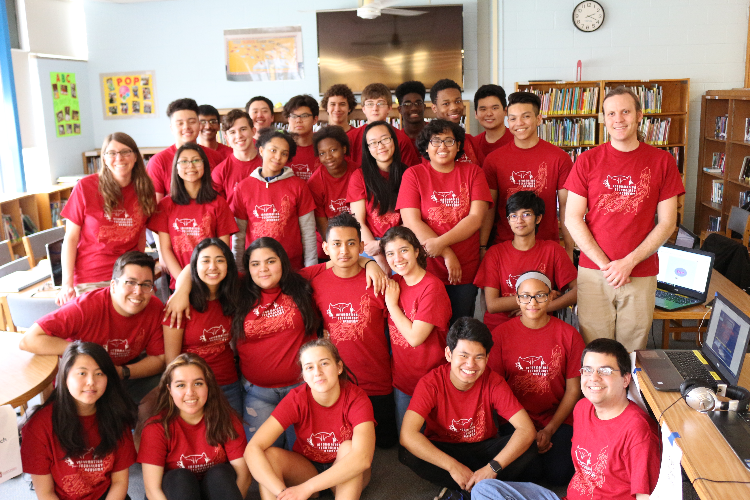 On May 1, 2018, Information Technology Academy (ITA) took ITA Madison Student Ambassadors to Orchard Ridge Elementary School for a Technology Road Show. The annual event aims to engage younger students through technology-based projects, and it is an opportunity to expose the elementary school community of students, teachers, and administrators to ITA’s program and mission as well as inspired the young students to consider education and careers in technology. In previous years, ITA worked with a range of schools such as Nuestro Mundo Elementary and Emerson Elementary. The work leading up to the Road Show began months earlier when the elementary school students collaborated with ITA students on the projects that would be revealed at the Road Show. Third graders from teacher Kayla Suing’s class and high school-aged ITA Ambassadors exchanged letters to generate video game ideas. Under the guidance of ITA’s Technology Services Manager, A.J. Daughtry Krill, and ITA Technology Instructors, the ITA Ambassadors worked hard over several months to create 17 fun and educational computer games that brought to life the elementary school students’ ideas. 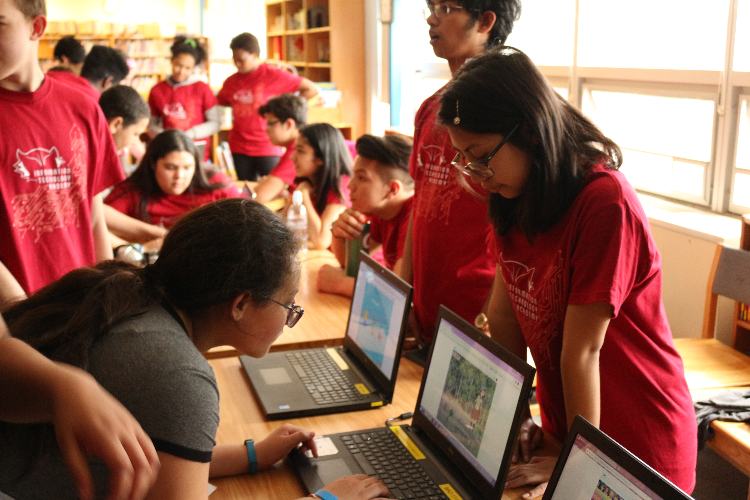 To create the games, most of the ITA Madison Student Ambassadors used Scratch, a free programming language developed at Massachusetts Institute of Technology (MIT) Media Lab and used to create interactive stories, games and animations. The students’ creativity shined in the games that had such focuses as mutant sharks, figure skating and puppies in space. The full list of games with links to play them is below. All of Orchard Ridge Elementary’s second-grade through fifth-grade classes were able to attend the Road Show where they were introduced to the games and had the opportunity to interact with each project. New this year, five ITA Ambassadors left their post for a short visit with the 4K class at Orchard Ridge. Led by A.J. Daughtry Krill, the five students talked about how their interest in things as kids led to their growing interest in a career in technology. Then, they had a small Q&A panel discussion with the four and five year olds. The visit made a clear impression on the 4K class and is something ITA is happy to run with next year! Not only was the program a fun learning experience for Orchard Ridge Elementary’s students, but ITA Ambassadors also learned from the experience. Some ITA Ambassadors — the designers of the games — could be seen making real-time tweaks to their programs based on player feedback. All ITA Ambassadors learned how to explain both the rules of their game and how they created the game, helping plant the seeds for future technologists. The collaboration and energy between the high school and elementary school students over technology was inspiring! The third-grade class also created a ballot box in which all of the elementary students voted for the project they thought was “most fun.” Mrs. Suing’s class tallied the votes shortly after the event and reported that there was a tie for first place! 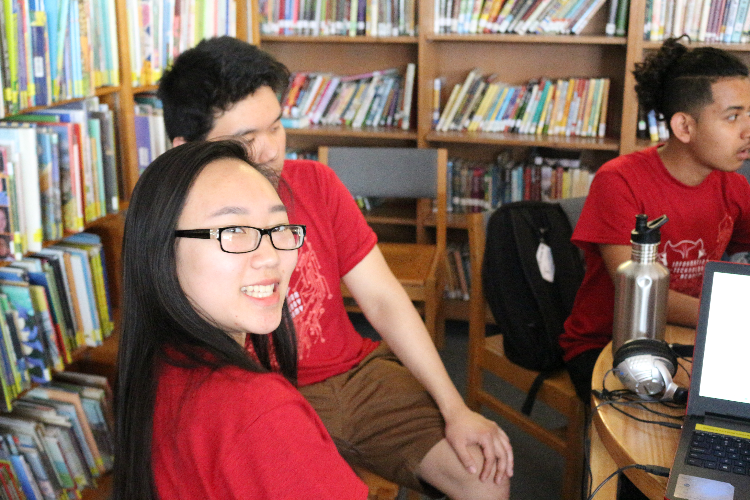 The event also attracted media attention with The Capital Times publishing the article, “Local elementary and high school students collaborate to design custom video games,” by Amber C. Walker. In our view, all the students were winners. We congratulate them on their hard work and successful collaborations! 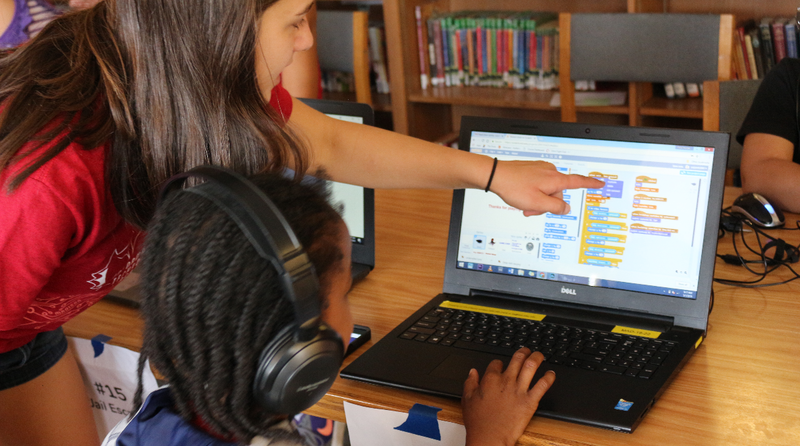 ITA Madison student demonstrates her game created in Scratch to an elementary student. 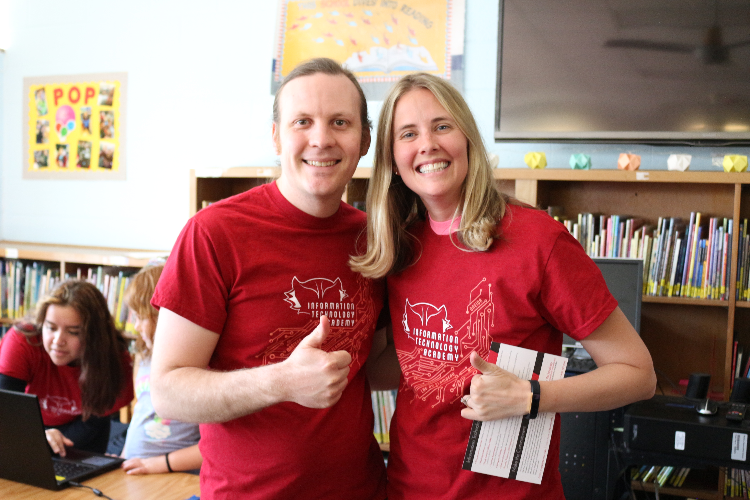 AJ Daughtry Krill, ITA’s Technical Services Manager, and Kayla Suing, third grade teacher, take a moment to celebrate the successful Road Show and their new ITA shirts. ITA Madison Student Ambassadors take a moment between demonstrating their games to Orchard Ridge Elementary School students.